This is a 100% honest, 100% authentic Flow-Thru Wash Brush review. Dadtography was not compensated in any way for this post. Some links below, marked as (af), may be affiliate links. 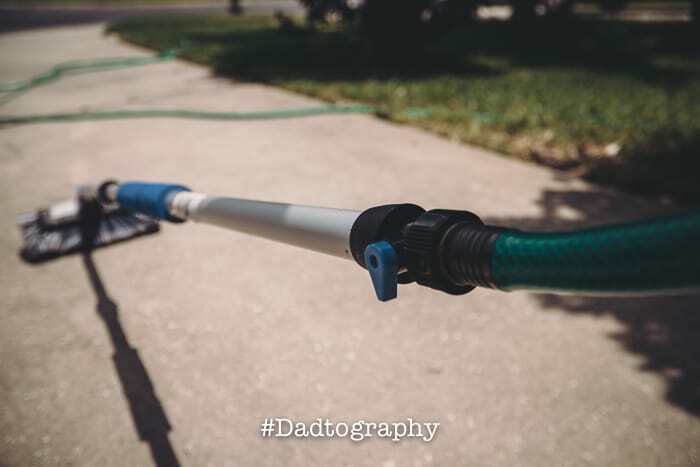 Sales made resulting from clicks on affiliate links provide a small percentage of each sale to Dadtography.com. All images are Dadtography.com originals. Please don't use our photos without permission. I received a Flow-Thru wash brush with soap dispenser and squeegee system for Father's Day this year (2015). I guess the family was over buying me dress shirts and ties. I do have a closet full of them, after all. I was appreciative to receive something different this year. However, that being said I have been washing my own car for years and I've tried everything under the sun to make it easier, cleaner or less work for me. Very few wash systems out there deliver on the hopes of those that purchase them. How does the Flow-Thru wash brush system stack up? Let's start with the wash brush attachment and soap dispenser. I have a lot of soap around my garage but I've actually found the best results come from dish soap. So, I loaded my brush end up with dish soap, which was fairly easy to do. The plug that keeps the soap inside the brush was easy to open and close and has a small plastic tab that helps prevent you from losing the plug. The soap dispenser plug also serves as the flow dial that controls the flow of water into the soap chamber. The more water that flows through the chamber, the soapier the water is. You can also turn it completely off from passing through the soap chamber so that no soap is dispensed into the water. Next, let's cover the extendable pole. The pole seems pretty sturdy and is made out of aluminum. The pole starts at 39", which is a good and manageable length for most passenger cars like mine. You can extend the pole up to 55", which can help for larger vehicles like 4x4 trucks, motor homes and other large vehicles. The on / off water control valve screws in between the hose and the pole and makes it so that you can shut off water flow completely from the hose to the brush. This also allows you to control the amount of water coming into the pole as well. I have yet to use the rubber squeegee as I primarily use my old faithful chamois after I'm done washing and rinsing, but in theory the squeegee could help keep those windows from getting water stained after you're done. My family purchased our Flow-Thru brush for around $18.00 USD at Costco, pretty much on a whim. No research prior to purchase was done and my wife may have chosen not to purchase it based on the reviews found online (at Walmart.com). That said, reviews aren't always the same experiences and overall I'm pretty satisfied with my wash brush system. I've used it a few times on my 4-door Honda Accord and I can say it's shortened my wash times by at least 15 minutes. 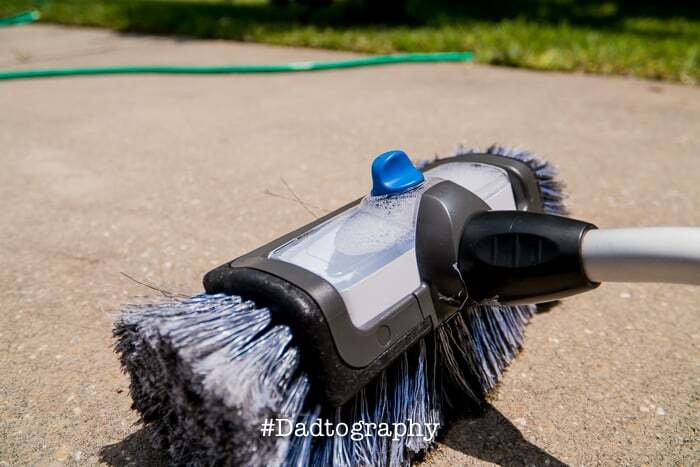 Overall, the wash quality is still good, although, for really dirty vehicles you may need to go over it more than once with the brush and soapy water. I even wash my wheels and tires with the system. What do you think? Have you used this brush or another car wash brush? Leave a comment below!